The start of Ireland's inaugural first Test against Pakistan has been delayed following overnight rain in Malahide. 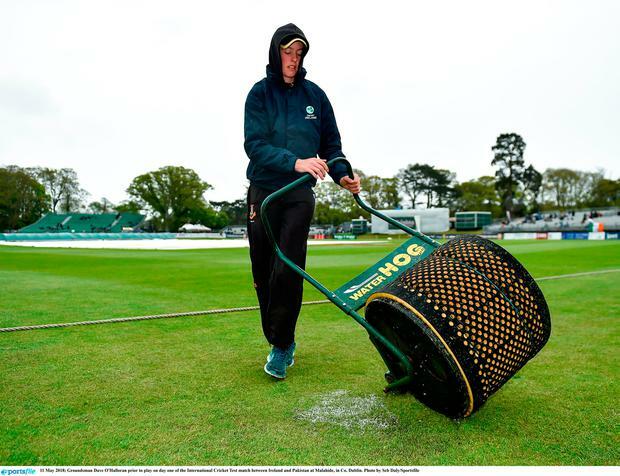 The Irish will become the 11th nation to play the longest format, yet heavy overnight showers and further light rain on Friday morning scuppered the prospect of the five-day contest beginning on time. That meant the toss was delayed, with umpires due to make another inspection at 11am. With little improvement in conditions, umpires Richard Illingworth and Nigel Llong elected to reconvene on the outfield again after 12pm. And it was then determined that there would be no play during the first session before lunch. With the rain still falling, the chances of any play today are looking slim.